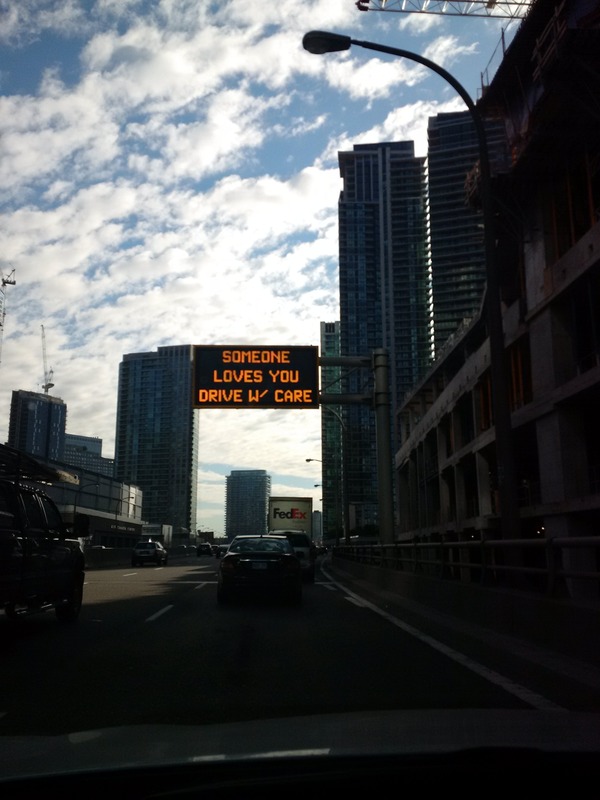 This sign was taken on the Gardiner Expressway in Toronto. 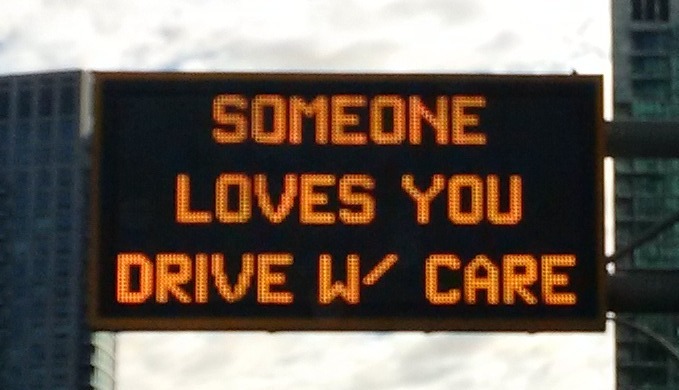 Very nice emotional appeal. Thanks to Nick Giovanelli for the picture. 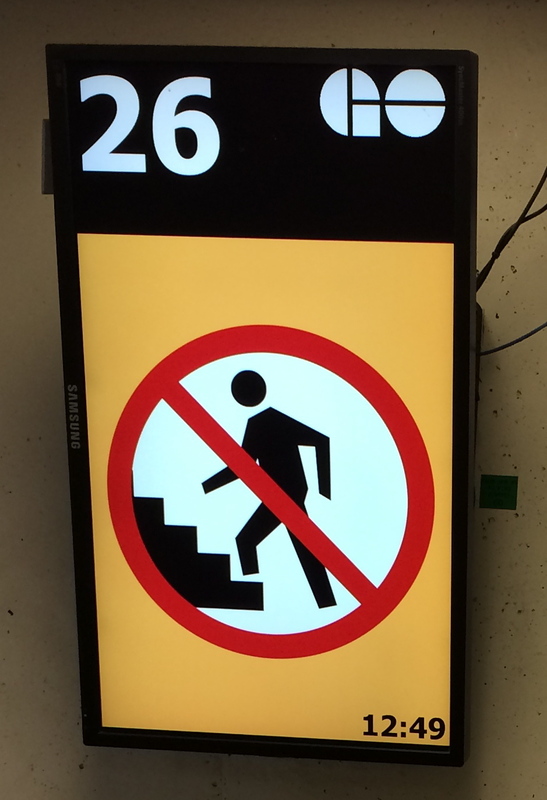 In an era in which most public authorities are trying to promote an active lifestyle by encouraging people to use the stairs, the sign shown here (from Toronto’s Union Station) is, at first glance, rather jarring. Of course, context matters — the sign makes a lot more sense once you realize that it’s posted at the bottom of an escalator, one that leads down from the train platform to the arrivals waiting area. I spotted this sign on a recent visit to Creighton University, in Omaha. Jarring, for a Canadian, since in Canada it goes without saying that you’re not allowed to carry a handgun onto a university campus, or just about anywhere else for that matter. The sign is also an interesting indicator of a conflict between regulatory authorities (in fact, the last line of the sign says so specifically). The state of Nebraska does issue concealed-carry permits. But Creighton is effectively saying that on their property, guns aren’t welcome, regardless of what the state says. Also shocking to a Canadian: the no-gun rule is, you know, just another rule — nestled in amongst signs forbidding smoking and telling you where to park. The reward for carelessness? Injury and death. In this case, it’s no exaggeration. This photo was taken at Peggy’s Cove Lighthouse, in Nova Scotia. 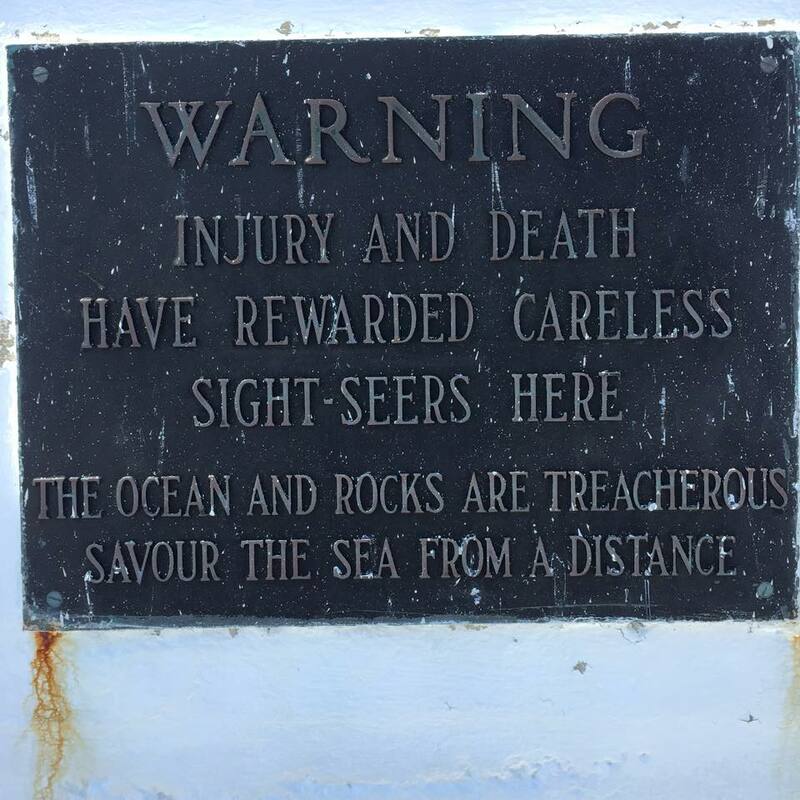 And people have been swept out to sea by the waves, here, and perished. But the wording of the sign is so lovely. Read it out loud. You almost can’t avoid saying it in whatever you conceive to be the stereotypical sea captain’s voice. Thanks to Brandon for the photo. 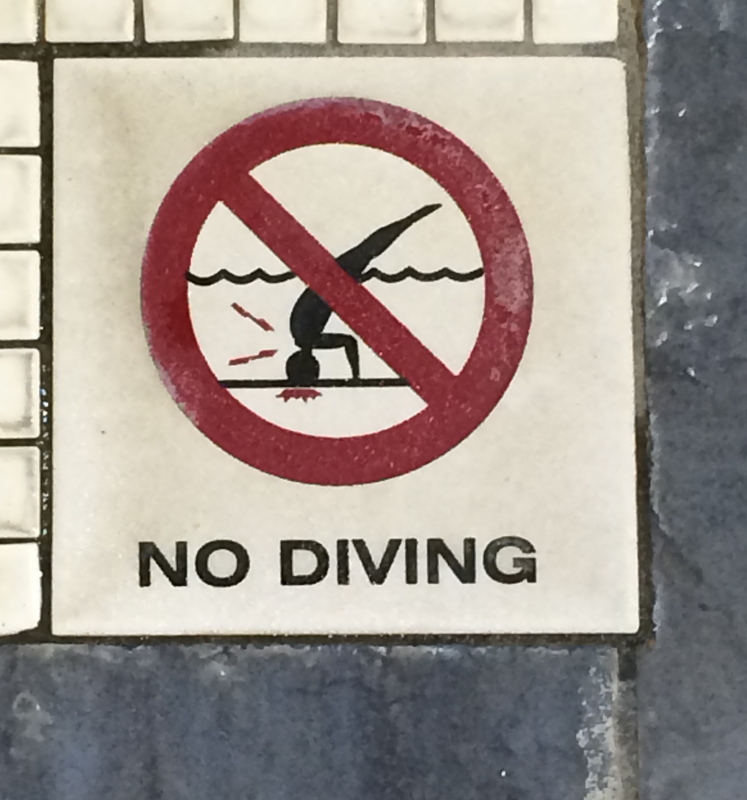 I’m amused by normative signs that include graphic depictions of serious physical injury. I guess they’re intended to be persuasive by means of the scare factor. But I find them amusing. This one is from a swimming pool — a uniformly shallow swimming pool — at a hotel in Niagara Falls, Ontario. This message is written on a garage door in Toronto. Hard to tell if it’s a hand-written normative sign over graffiti, or the other way around. But I walk by it regularly, and I kind of love it. 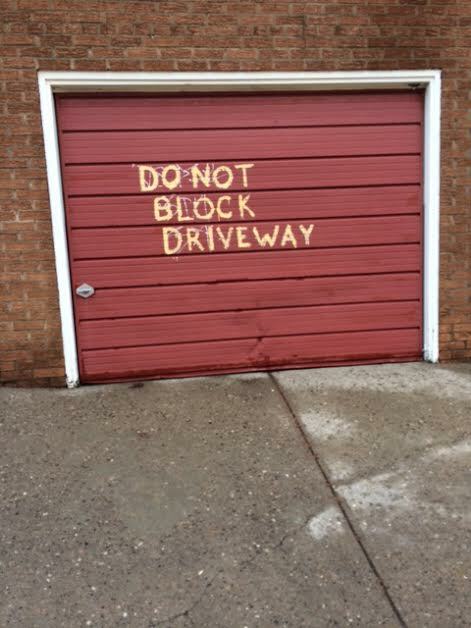 I believe the home-owner has written over the graffiti. But I love that the owner’s message is only barely more “official” looking than the graffiti. The net result is art. Is this a normative palimpsest? Or a pentimento? This was taken at Peet’s Coffee, in Cotati, CA. 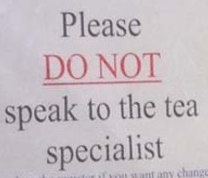 Does the person who posted this sign have a sense of humour, perhaps? 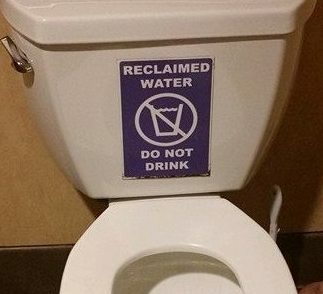 Or does he or she truly worry about patrons drinking from the toilet? Is this establishment frequented by dogs who can read? The picture is by Rich Way, via Thea Smith. 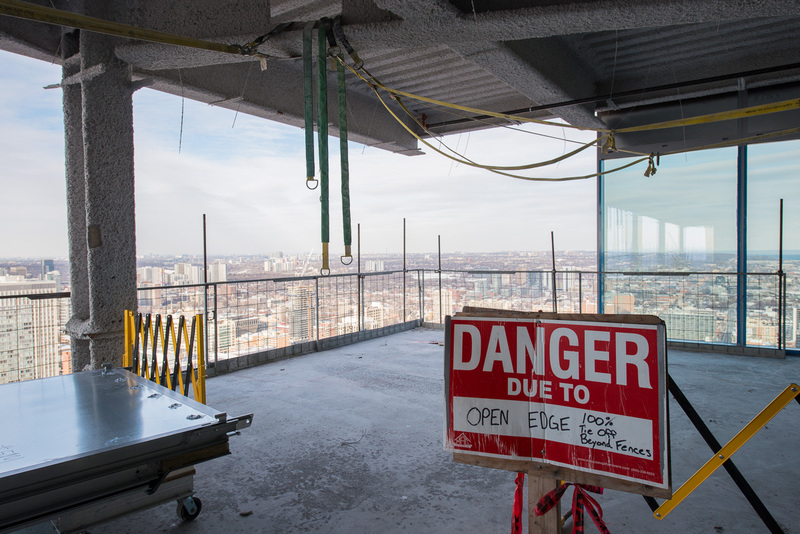 File this one under “obviously good advice.” This sign is posted at a construction site, 43 floors above the streets of Toronto. Rather amusing that the specifics — 100% tie off beyond fence — are written so small as to be practically a footnote. Thanks to Eric Fruhauf for the photo. This one comes to us from the hallowed halls of McGill University. 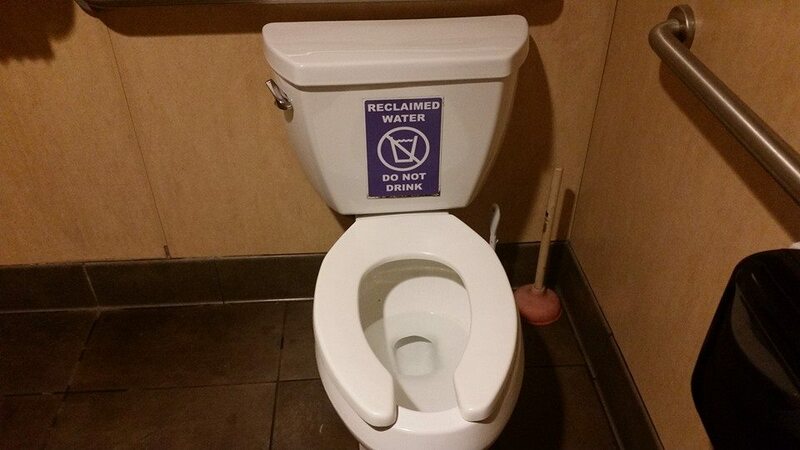 It is unclear just how official this sign is, but how emphatic it is is less unclear. The point it makes is no matter of mere manners: it’s a serious pragmatic point about the frailty of plumbing systems (especially, I dare say, at a venerable institution like McGill, where a lot of the buildings are well past their ‘best-before’ date.) 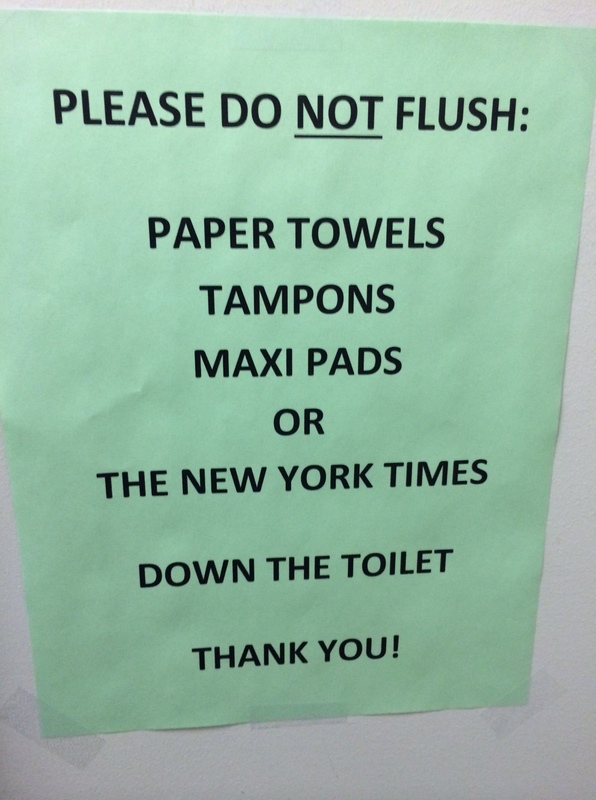 But I wonder how much of that serious point is undercut by the jokey reference to not flushing the NY Times? Thanks to Prof. Jacob Levy for sending the picture.